← how do touch screens work? 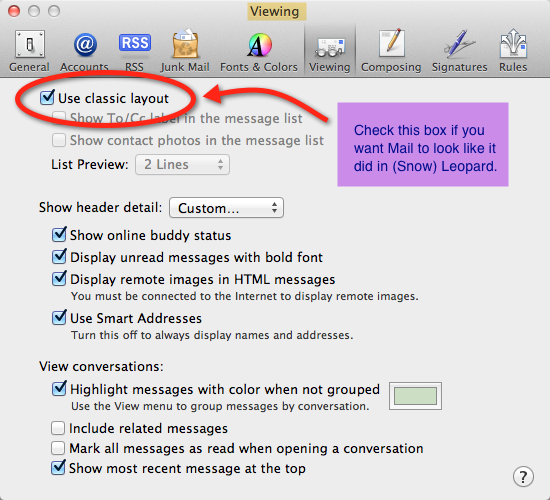 Posted on July 24, 2011, in Mail, OS X Lion and tagged classic view, Mail, return Mail to classic view. Bookmark the permalink. 2 Comments. Awesome!! thanks for this, I looked everywhere for the info until I just googled my simple question. for a person who gets 100 emails a day, the new view (let alone organizing things by conversation) was putting a serious stall in my productivity and driving me up the walls! I was soooo relieved when my mail snapped back to the easy and clear, lay out!! !